We have made a number of improvements based on player feedback, and are excited to announce the best version of Catacombs yet. All pledges come with three big double sided playmats. Renegade Games this week has picked up another classic. Ranked 72nd on Board Game Geek is the game: Trajan. Designed by Stefan Feld, known for making the freshest point salads you’ve ever tasted. This game has elements of card drafting, area control, set collection, and hand management. At least that’s what BGG is telling me, as I’ve yet to play this game – now may be my chance. In a similar announcement, Splotter Games has revealed a new expansion for Food Chain Magnate with the selling point being a new ketchup (catch up) mechanic. This is probably to counter the main criticism of the game, whereby if you mess up your first few turns it’s near impossible to win. They’ve also committed to reprinting some of their other hard-to-find titles. Heavy gamers rejoice! When it comes to customising games, I don’t think anything will top this beautiful custom job of Spirit Island. It helps that it’s my favourite game, but I can only imagine the effort put into this work of art. It is absolutely gorgeous. Well done Guillaume! That said, here’s another customisation that comes close – not really, but I needed a segue. 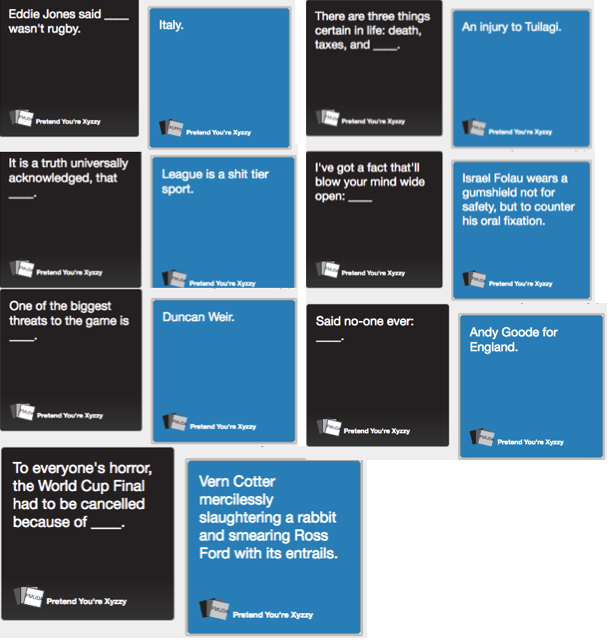 I’m not a huge fan of the dumb humour generated by Cards Against Humanity, but I couldn’t help but laugh at this custom a custom rugby version. This week’s article comes from Boards and Bees celebrating their 8th year of blog writing. An incredible achievement! Instead of just celebrating though, asutbone has put together an article about their favourite 8 game pieces of all time. They’ve done a great job selecting components – introducing some new board games to me as well. Reading it was like my eyes were hot knives, and their words were butter. That’s all for this week. Did I miss any news? Let me know below! Next ›Deck-Building is Dead. Long live Deck-Building! A Dale of Merchants Review. Lol you can’t read everything!